Duncan, Caroline, Barry, David and Katie. As guardians of the Friend archives, as well as the archives for all the other DC Thomson brands, we help the “Friend” staff to find material to use in the magazines or that can inspire new ideas. Depending on the intended use, we often need to scan or photograph this material. We also find ourselves fact-finding or fact-checking points that the editorial team vaguely remember, but need confirming. The “Friend” editorial staff are regular visitors to our office and we’re slowly training them to bring cake and biscuits. No week is really typical in the Archives – we rarely know what is coming next as the editorial teams are creative, curious and often demanding (although the PF team are always lovely!). Barry as Assistant Archivist deals with internal and external enquiries and manages the staff who undertake the digitisation work. Barry is also part way through cataloguing the “Friend” collection! 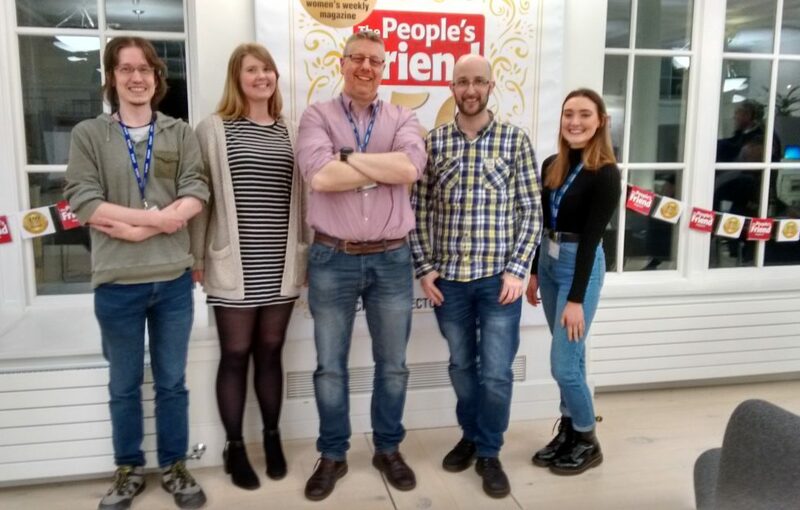 David, as Archive Manager, works with the Editor on forward planning and events, such as the Afternoon with the Friend at the Mitchell Library on April 5 and the exhibition and series of events taking place in the Scottish Storytelling Centre in Edinburgh in May. Queries from readers often come to us. Probably one of our favourites was someone who had lost the last few lines of a vintage knitting pattern from the “Friend” that we managed to find. We sent her a replacement copy so she could finish her jumper! No two days in the Archive are the same and the variety of work keeps us all enthused. Barry can be cataloguing tea towels in the morning and running a tour for advertisers or “Friend” prizewinners in the afternoon before having to scan some pages for reuse in a feature before going home. Katie, our Archive Technician, had great fun putting together a display at the Head Office for the 150th birthday party as well as scanning a large number of front pages for the online map. A history graduate, Katie believes she has learned more in two years working with the “Friend” than she did in 4 years of degree study! For David, his favourite moments are when individuals connect with something in the archives. This can be as simple as finding something they’ve been looking for really quickly, or when they find the missing piece of the jigsaw that makes everything else slot into place. Often, it’s just seeing the sheer delight of someone lost in a historic volume of documents. What Size Is The “Friend” Collection? The Archives hold copies of every issue of “The People’s Friend” magazine published, and this is the most heavily used bit of the collection. It contains over 200 volumes (about the weight of half a rhino), as well as loose issues of the magazine (probably the same as a quarter of a rhino!). Thankfully, the store floor is heavily reinforced! The collection also includes J Campbell Kerr’s original cover art work, examples of free gifts and marketing materials, tea caddies, pocket novels, tea towels, and editorial records that document the Friend’s fascinating history. We’ve been lucky that the “Friend” seems to have had staff who really understood the value of their heritage. To which end the magazine has one of the most extensive archive collections of any DC Thomson title. All in all, it’s probably more like half an elephant than half a rhino in weight! Barry loves the fact that the “Friend” has its own theme song – we’re not aware of any other publication that can claim this. Maybe this is something for the work-based choir to try?! For David, it was the discovery in a basement of old cinefilm which turned out to be 1960s TV adverts for the “Friend”. We had these digitised – they’re wonderfully out-dated and hilarious but demonstrate the practical nature of the gifts given away with the magazine. Also, he is rather worried about the number of former “Friend” editors with cardiac problems so he keeps a careful watch on Angela. Katie loves the unexpected content and learning to be found from answering enquiries. She was once asked to locate a page from an 1889 People’s Friend detailing some “popular musical instruments” of the time . . . Anyone ever heard of a dulcimer, because she certainly hadn’t! She now also has a recipe for Meringue Surprise – believe us, it’s not one to be shared. Barry was also delighted to find a note attached to a knitting book the magazine brought out in the late 1950s. Recognising the fact that editorial staff were known to (literally!) cut and paste from unguarded volumes, someone had the foresight to warn off potential vandals with a note saying “Do not cut this book!! Photocopy. On pain of death!!”. It brings cheer to an archivist’s heart. David has been involved from the start of the preparations, working in fear of the Editor and highlighting where the archives can help (or not). As a result, Archive material was key to the 150th anniversary special and we supported the Editorial team who spent months going through old content to create the story of the “Friend”. We’re also key players in the public events planned as part of the 150th celebrations. It’s been great to make links between the “Friend” and academics at the University of Stathclyde. Charlotte Lauder is undertaking her PhD which draws heavily on “Friend” content and it’s been fun to share our knowledge and discoveries. The sheer size of the collection has kept Barry busy as he tried to pull it into order and get it catalogued. Don’t touch one of his piles of organised chaos or he will shout at you! We’ve digitised no end of material for reuse in the weekly magazine, specials and anniversary special, as well as for use in web content. We also had the first ever issue of “The People’s Friend” go off to a professional paper conservator to give it some love and attention. We also enjoyed our fifteen minutes of fame, with our periodic online blog “The Archives Guys” featured on the website. This is where we can let people know what we’ve been doing and about the weird and wonderful things we find. Fame extends to the occasional TV appearance, too, and Barry got to wow the TV crews which the sheer amount of knowledge he has absorbed about the “Friend” in the last few years. It’s not difficult to talk about the “Friend” – any volume you pick up of it is packed with interesting content that is great to discuss. Meet some of the other fab departments we work with in the “Friend”.